Apologies for the delay in posting but have had a busy old time. Out of 11 days I was racing for 8 so not had much time to send updates. Like most circuits this year, this was a new one for me. 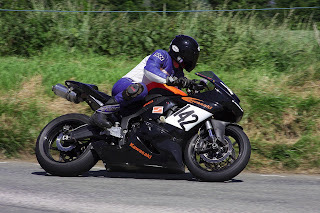 I’ve raced at her sister circuit, Killalane a couple of times but not Skerries. I say it’s the sister circuit as it does share some of the same roads as Killalane, but not enough that my previous laps helped. Again as a newcomer it was off on the newcomers coach, and we had a great talk by Andy Farrell, who got us off the coach at various points to show us the circuit. I took the 600 out for the newcomers laps , followed by a 600 practice. Then it was the turn of the 400. All was going well until I tried to use a 600 braking point to stop her for the hairpin. The brakes on the 400 aren’t as good as the 600 so realised I wasn’t going to make the corner. I kept to the outside of the circuit so as to not get in the way of anyone else. This was my downfall as I hit some dirt, locked the front wheel and down I went. Luckily apart from a few scuffs the only damage was a bent screw which holds the gear lever on, an easy fix. During the rest of the session I started the bike and offered to ride back to the paddock, but was told I had to wait for the recovery van. I’d rather take my chances on the bike as I’ve experienced the recovery truck before and its not fun. I changed the gearing for race day and it seem to make a difference to both bikes. Sadly I missed a race as it was listed in the programme as a 250 race. I found out during the race 400’s were racing as well. I wasn’t too upset as it was the beginning of a long week. When I went to the 400 race I found out they’d missed me off the grid and thanks to Steve, who managed to talk them round, I got on. All was going well in the race and was having a good dice with another 400, when coming into the chicane on the last lap I was hit from behind by another bike. After 3 attempts I got the bike to steer around the chicane and managed top stay upright. I heard after that the rider had come off the bike the corner previous and was hit by a stray bike. I never saw the bike, even after hitting it, so can’t confirm this. Still it was a good day and hope to race there next year. Racing at Skerries finished on Saturday evening so we drove north on Saturday evening ready for an early ferry to Isle Of Man on the Sunday. When we arrived at the ferry it was like the whole paddock from Skerries had set up camp there. It was great to be back on The Island, despite the fact that the brakes on the van packed up. Still we got to Chicken Shed HQ, our base for the week, and promptly set about swapping the engine in the 400. We had to sign on at Castletown that evening but on our return we carried on with the transplant. The reason I wanted to swap the engine was that it was a new one I’d bought so just wanted to see if she ran ok under load, and as there is quite a bit of practice at the Southern it was the ideal time to do it. The engine went in fine and ran ok so Monday we headed off for practice. This is the 4th time I’ve raced at the Southern so should know where I’m going. There is one corner which I just don’t get on with so this year was going to go for it. In the first practice I readied myself as I approached the corner, when the guy in front clipped the bank. He was ok and probably looked worse than it was but I decided that wasn’t the lap to attack the corner. Still as practice went on I did summon up the courage and felt a lot quicker through there. The 400 went well although it wasn’t running right, but this was down to the carbs rather than the engine. After practice it was out with the new 400 engine and in with my race one. Steve and I are getting very good at swapping engines now. I met up with a mate on the Island who said it would take him 6 months to swap an engine so found it amazing that we could do it in about 3-4 hours. I had a good couple of dices during Tuesdays practice and so it was to race day on Wednesday. This was a race on the 400 and it was a cracker. I was in a group of about 4 and was lots of overtaking, being overtaken, and the reovertaking. It went on like this all race so the chat with the others involved after was full of smiles. I’d also managed to knock a second off the fastest lap I’d done around there so was very happy with that. I was later told that to do a 3 minute lap on a standard road engine was going some, so was proud of that. Thursday arrived and on the way to the circuit I was amazed as to how many people were waiting already to watch. When we went to practice on Monday evening there were spectators waiting as we drove down. I’ve seen this before on race day but never on practice, it really has grown in popularity. I was out first on the 400 and again was having a good race, when coming into the final corner the front wheel stopped causing an impromptu stoppie. OK I thought got away with it. I leant into the next corner and it felt like I had a puncture so rode to the paddock. Upon inspection Steve found that the radiator guard which protects the radiator from stones, had snapped off its mountings and fell onto the wheel, lodging itself between the front wheel and mudguard. So I was very lucky to have stopped when I did as I’d hate to imagine what might have happened if the wheel had locked whilst leant over. Even in the 3 laps I did before this I’d managed to knock a further second of my best time. Sadly the 600 race was stopped on the last lap due to an incident, but up until then it was going well and was looking forward to my last two races. It turned out that the 600 race was my last race as due to a further incident during the sidecars racing was cancelled. All in all it was a good week and am pleased with the progress I’m making. Nearly all the circuits I’m racing at this year are new to me so it is nice to go to one I know so that I have a point to measure any improvement by. Saying that, I think the time has come for more power. The Southern is a great meeting and is run very well, so thanks guys and hope to be back next year. Back across the Irish sea on Friday to race at Walderstown about an hour outside Dublin. I did a lap in the van of the circuit in the van and couldn’t believe how short a circuit it is, just 2 miles, most of which was flat out, not in the van though. Practice went well but confirmed my suspicions, I need a tuned engine as on the straights people were leaving me for dust. I had have a ‘chat’ with the clerk of the course as , apparently, I was shown the finishing flag twice. However I saw only the last lap flag, as I was overtaken by William Dunlop, then shown the finishing flag on my next circuit. Sadly it comes down to their word against mine so I just had to apologise and get on with it. Luckily I was cautioned and that was the end of it. However it was funny as after that they seem to make doubly sure all flags were shown in a more prominent fashion. For Sunday race day I changed the gearing for more acceleration to help get off the line better and out of corners. This means that top speed is reduced so was hard to see guys I was catching up around the corners pulling away from me on the straights, more power me thinks? Still it was a good meeting and was a good finish to a very long week, made even longer by the hot weather. It was a hard week but racing was good and I met lots of good people. Sadly the ugly side of the sport reared its head at The Southern and Walderstown, when 4 competitors lost their lives to the sport they love, in 4 separate incidents. The paddock was a very sombre place to be as it touches us all. As I always say the penalty far outweighs the crime when racing on the roads, a mistake you could make on a short circuit which makes you run onto the grass, when racing on roads could mean you pay the ultimate price. My thoughts go out to the family and friends of those involved and also to all those that help when something like this happens.